Who are the TurpinTyme Ragsters? 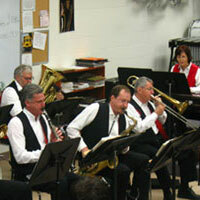 The TurpinTyme Ragsters are a 7-Piece Ragtime music ensemble based in Kansas City. We hope to turn the clocks back, musically, to a era of ceiling fans, ice cream socials, and Sunday concerts in the park. The Ragsters were formed in 1993 with a desire to play a unique style of music. Since the MidWest in the early 1900's was a virtual "hot bed" of Ragtime activity from Kansas City to Sedalia to St. Louis we knew we were on the right track. So, armed with a list of local composers that reads like a Who's Who in the Ragtime "Hall of Fame" to draw from, how could we go wrong? Why do you play Ragtime music? Simply stated, performing the music of Scott Joplin, James Scott, Charles Johnson, Joseph Lamb, Eubie Blake and our namesake Tom Turpin, makes us happy. We hope it will do the same for you!